The Wet'n Wild Waterpark in Cancun claims to be the best waterpark in Latin America. The park works in conjunction with a splendid dolphinarium which is a very popular attraction in Cancun. Many resorts offer joint packages to the waterpark and dolphinarium. 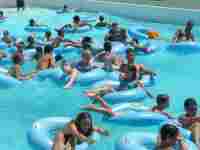 Attractions at the waterpark include a wave pool, a lazy river, a kiddies pool, bumper boats, and four or five waterslides including the Twister, the Kamikaze and the Bubble Space Bowl. There are also plenty of beach loungers for those who just want to relax in the sun. Tickets are expensive, but include unlimited beverages, ice-cream, snacks and meals. There are lifeguards on duty and medical attention on standby. Address: Blvd. Kukulcan Km. 25 Hotel Zone Cancun. Opening times: Open daily 9am to 5pm. Admission: US$49 (adults), US$43 (children).